Two East Bay environmental groups are teaming up for the first-ever Christmas Bird Count in the densest habitat for golden eagles in the world. There has never been a Christmas bird count in the Sunol and Ohlone Regional Wilderness Areas. Conservationists, scientists, and bird lovers have conducted a nationwide annual bird tally every holiday season for more than a century. The count is an important tool for assessing the health of bird populations throughout the Americas. But since the Christmas Bird Count began in 1900, there has never been one in a section of the East Bay that is home to some of the most majestic raptors in the world, including golden eagles. But that's going to change this week, when the Ohlone Audubon Society and the Alameda Creek Alliance team up for the premiere winter bird count within the Alameda Creek watershed in southeastern Alameda County. Teams of volunteer bird lovers will begin the 24-hour count on Friday, December 18, around Sunol, Pleasanton, and Livermore, in a fifteen-mile radius of Del Valle Reservoir. The count area includes the Sunol and Ohlone Regional Wilderness areas, the jewels of the East Bay park system. Volunteers will walk, mountain bike, or drive around the count areas in search of wintering birds. The tally, however, is designed to be an un-obtrusive observation, with counters following an ethics code to avoid disturbing birds and their habitats. "There's a lot of remote woodland," said Jeff Miller, director of the Alameda Creek Alliance, an environmental nonprofit that for years has sought to restore the steelhead run in Alameda Creek. "This area has never been included in a Christmas count before. We think it's going to be an important count in the Bay Area." 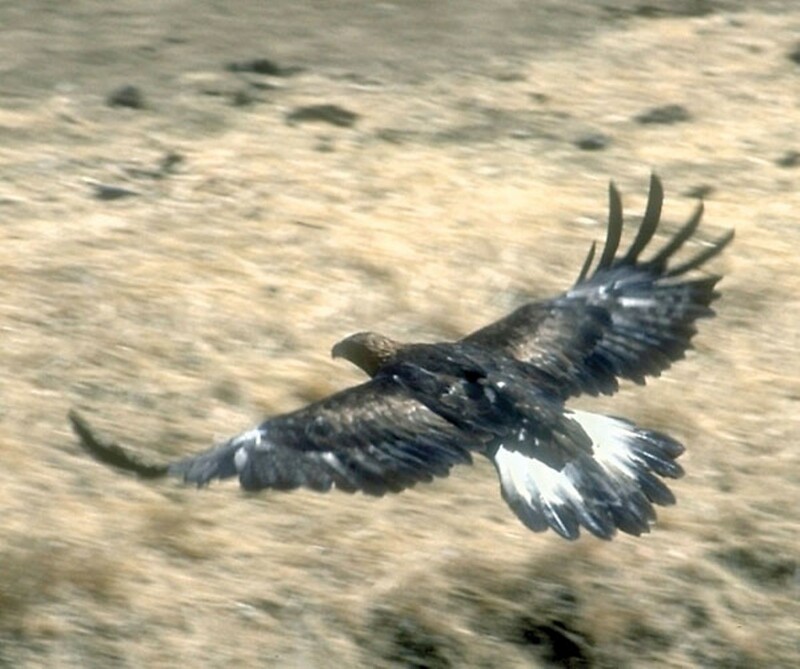 The Sunol-Ohlone area is home to the densest habitat of golden eagles in the world. Other notable species that counters expect to find include western burrowing owls, which along with the golden eagles have been killed in startling numbers in recent years by the aging wind turbines at nearby Altamont Pass. In addition, the counters likely will see yellow-billed magpies, which are native to central California but have been impacted by West Nile virus and the loss of oak woodland habitat, and Lewis woodpeckers, brightly colored birds that love open-canopy forests and are a species of special state concern. The counters also likely will spot bald eagles, which only recently began breeding in the Bay Area and were just removed from the Endangered Species List. The fact that this is the first-ever winter count in a spectacular woodland area has attracted some "hotshot birders from around the Bay Area," Miller said. Historically, the Christmas Bird Count began as an environmental alternative to annual Christmas hunts, in which teams of hunters competed to see who could kill the most wildlife. Today, the bird counts typically include a different kind of competition — to see who can spot the highest number of species or the rarest birds. "There's a real competitive aspect to it," Miller added. "It's about who comes back with the coolest sighting." To get involved in this year's historic count, visit OhloneAudubon.org or AlamedaCreek.org. Berkeley-based Build It Green, which came up with the respected GreenPoint Rated system, recognized some of the leaders in the world of green construction at an awards reception last week in downtown Oakland. The East Bay award winners included Berkeley-based Sun Light & Power, which has been doing solar installations since the late 1970s. "They've been a leader in solar power for thirty years," noted David Myers of Build It Green. The awards ceremony was the first of its kind, and Build It Green intends to make it an annual event. Other East Bay award winners included Truitt & White, a Berkeley lumber company, which offers a wide array of eco-friendly building products. "They've been a crucial partner in green construction over the years," Myers said. Build It Green also gave a public sector award to StopWaste.org, the Alameda County Waste Management Authority, which began in 1976 and concentrates on reducing waste and increasing recycling. For a full list of the award winners and more information about Build It Green, visit BuildItGreen.org.